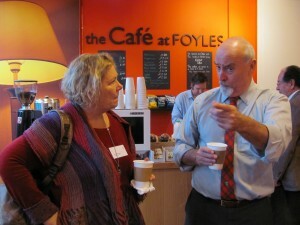 Foyles Bristol was the venue for joining up with around thirty other SilverWood Books authors, plus a crowd of writers eager to learn about getting their books to publication. 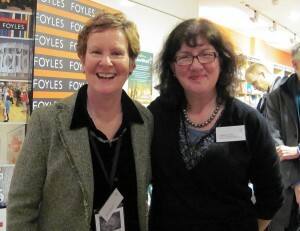 The writing and publishing open day was brilliantly organised by Helen Hart and her SilverWood team and run jointly with Rob Norton events supervisor at Foyles. The mood was informative, professional and above all fun. I talked to so many people, I needed regular injections of caffeine from the Foyles coffee shop. 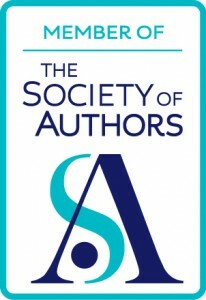 Topics included writing and editing, book design – covers and interiors, book promotion and author platform, getting your book into bookshops, audiobooks and crowd-funding. 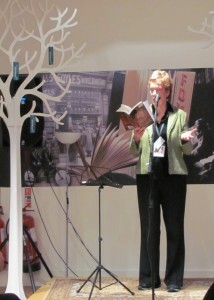 Authors read from their own books (including moi). The big challenges were talking into the microphone without making the sound blurred and harsh and not overdoing the drama queen act! Historical authors Anna Belgrage and David Ebsworth discussing a serious point. Some authors using SilverWood Book services had only ever met each other and the SilverWood team virtually. They lost no time swapping notes about writing, research and promotion! 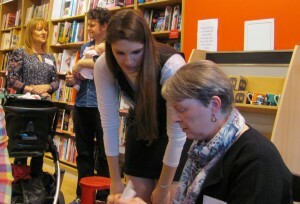 Talking to fans as well as to the SilverWood Books team. Self-published/independent authors can sometimes feel isolated, but this was very much the meeting of a community which regularly interacts virtually but on Saturday took enormous pleasure in meeting in ‘real life’. 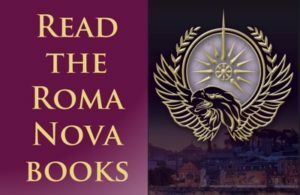 And I loved chatting with fans (yes, there were some Roma Nova ones!) 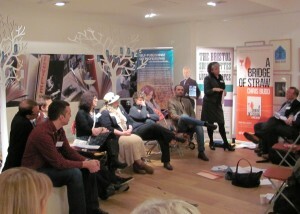 and talking to new and potential authors just starting on their publishing path. 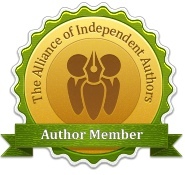 20 comments to Indie authors united! Ha! Spotted me and my hat in your photos! Wasn’t i a grand day! Well done Foyles and SilverWood! Love your hat, Helen! Yes, it *was* a grand day. I talked my self hoarse. These are really ‘snaps’ in between talking! I’m looking forward to the official photos, but I think they will all show the enthusiasm and enjoyment that flowed through the day. And I bet you’ll get fulled booked again for the next one on 20 September. It was a huge pleasure to meet you in RL, Debbie. Quite surreal, but affirming, when these good virtual friendships turn into real ones. 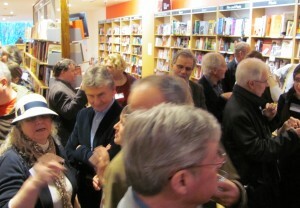 Delighted to say that I was there, too, enjoying such a buzz amongst the Silverwood authors, and the professional organisation of the event. It’s certainly given me plenty of food for thought. Breakfast time, Alison, was particularly good. Haha! We had some lovely writerly chat, didn’t we? LOL I wasn’t prepared to get up that early! That was terrific! Mildly strange, but we were soon chatting away. A real sense of community. It was a brilliant event. Good to meet all those that I did and sorry not to get to chat to everyone! Love the pics, Alison. Really sums up the day! There were too many people to talk to, Wendy. The piccies are just a few quick photos. Longing to see the official ones!